Pickleball is the fastest growing sport in America. The game combines elements of tennis, ping-pong and badminton. The rules are simple and the game is easy for beginners to learn, but can develop into a quick, fast-paced, competitive game for experienced players. There are hundreds of Pickleball players in the Upstate. New players are always welcome. If you are interested in playing, just show up wearing court shoes at any of our scheduled playing sessions and we’ll put a paddle in your and teach you how to play. The video below is a good introduction to the game. 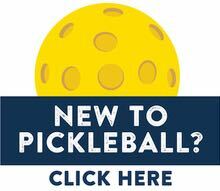 Learn more about Pickleball by watching/reading below and by visiting the website of the United States of America Pickleball Association. Pickleball is played on a badminton-sized court: 20’ x 44.’ The ball is served diagonally (starting with the right-hand service-square), and points can only be scored by the side that serves. Players on each side must let the ball bounce once before volleys are allowed, and there is a seven-foot no-volley zone on each side of the net, to prevent “spiking.” The server continues to serve, alternating service courts, until he or she faults. The first side scoring eleven points and leading by at least two points wins. Pickleball can be played as a doubles game or singles game. CLICK HERE to learn about how to play Pickleball. The ball is served diagonally to the opponent’s service court underhanded without bouncing it off the court. Double Bounce Rule: Following the serve, each side must make at least one ground-stroke, prior to volleying the ball (hitting it before it has bounced). Download a Rules Summary Sheet (.pdf) and CLICK HERE for more information.